Choosing the right material for USMLE preparation is the key to achieving high scores. There are a number of options out there in the market to prepare for the USMLE Step 1 exam. From our experience, we have found both the pros and cons in each one of them. The USMLEWorld Step 1 Qbank, while retaining the best features, answers all of the shortcomings and also has some new features helpful for the exam. Please read along for a detailed overview. In the study “Are Questions the Answer? The Effect of Popular Study Resources on USMLE Step 1 Performance” (published by the Association of American Medical Colleges), researchers determined that a “student who completes the entire UWorld Qbank would increase his/her score by 20 points (1 SD on Step 1) as compared to the same student who does 0 USMLE World Questions”. The researchers, out of Albert Einstein College of Medicine, Massachusetts General Hospital, and Kaiser Hospital, surveyed first-time test takers in 2011; the study identified that “USMLEWorld shows the greatest effect” on those preparing for the exam and concluded that they “recommend USMLEWorld” for students preparing for the exam. 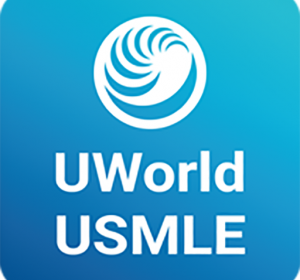 At USMLEWorld, we strongly believe that it is not just the number of questions that you practice but the number of high quality questions that you understand in order to obtain high, competitive USMLE scores. Therefore, the physicians at USMLEWorld have designed the Step 1 QBank with focused, high yield, and up-to-date content and explanations that meet the current objectives of the real exam. Each question requires a three to four level mode of thinking, which is much more difficult than what you would encounter on the actual USMLE exam. We are confident that if you practice all of the questions in our Qbank at least twice and read each explanation at least two to three times, your chances of earning a competitive score will increase. In addition, we continuously update our Qbanks to ensure that our high quality questions match the changing standards of the USMLE. After ample preparation, practicing as many high quality questions as possible is the key to scoring high on each USMLE exam. In many USMLE Qbank sources, an average student can answer around 70%-80% of the questions. This means that by spending a good amount of time and money, you end up learning only 20%-30% of new content. Unlike our competitors, our practice questions are much harder, making it much more difficult for an average student to score high in the first few attempts. The goal is not to discourage students, but to motivate them to study harder and smarter. Average scores for USMLEWorld border around 50%-60%, implying that, on average, a student learns 40%-%50 of new content with our QBank. The USMLEWorld Qbank question items are designed to test the difficult part of the examination content while incorporating the less to medium difficult concepts in each question’s explanations.